Wicked Nix, “foulest of the fairies,” encounters a magic that resists all the standard fairy spells: the power of human love. 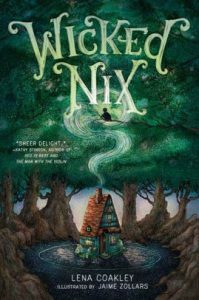 *Wicked Nix by Lena Coakley, illustrated by Jaime Zollars. Amulet, 2018, 163 pages. A terrible thing has happened: “There is someone is the forest.” A people has moved into the abandoned cottage near fairy meadow, and if there’s anything the Good Queen can’t stand it’s peoples encroaching on her territory. Since it’s almost Midsummer’s Eve, the man-people must go. Wicked Nix, who bills himself as the foulest of the fairies, issues a warning first, promising to make the cottage fires smoke, transform garden greens to thorns, turn well water to skunk spit, and make the cows sprout wings and fly away. Nix doesn’t know how to do any of that, exactly—especially the flying cows. But since the fairies abandoned him last year he must get back in their good graces, especially the Queen’s. What if the people refuses to move? This slender but affecting story draws on old Celtic legends of the fairy folk, who were not friends to men. But it also reflects the childish resistance to growing up and learning to behave. There’s a barbarian streak in every child, a source of both joy and sorrow to himself and those around him. Wicked Nix highlights that conflict but lets it end on a sweet, sunny note. A lovely layout and simple illustration add to the mood and make this a fine family read-aloud.